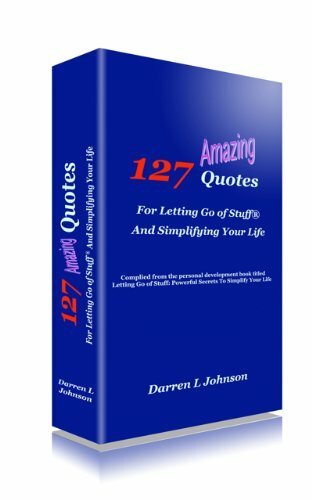 Darren L Johnson is a dad, author, speaker, trainer, and the nation’s leading expert on letting go of stuff. The primary reason for founding the Letting Go Cafe is to provide a way for every person on the planet to get unstuck, as needed, and to do it – on purpose. More people need to understand how and why it is important to learn to let go of anger, guilt, and most importantly, learn to let go of the past. Darren has been researching and teaching principles of letting go since 1994, when he left the corporate world to step in to the world of business ownership. Today, he has turned his teachings into a series of e-books, a paperback, CD audio, and a digital online program – all under the umbrella of Letting Go of Stuff®. You can visit Darren’s website anytime. The Letting Go Cafe offers solutions for those who want to let go in a complicated world. Darren also founded National Letting Go of Stuff Day as a way to give people one day a year when they can consciously choose to let go and measure their letting go success from one year to the next.